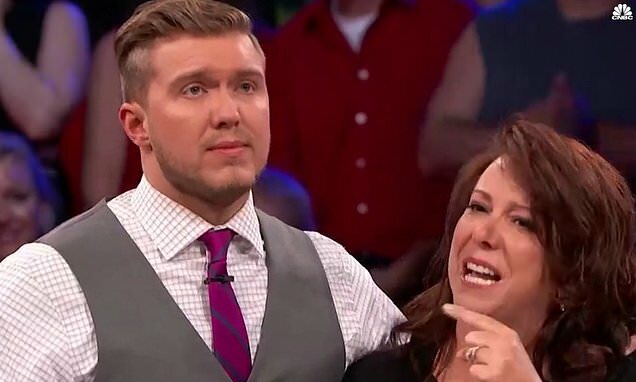 A hero who helped carry an injured woman to safety during a mass shooting in Las Vegas has won $120,000 on Deal Or No Deal - and was reunited with her live on the show. Justin Uhart, 27, saved the life of Jan Lambourne at Route 91 Harvest country music concert where 59 people were killed and more than 500 injured in October 2017. The loan officer had been working as a bartender at the event near the Mandalay Bay hotel and started to run as bullets hit the crowd but stopped when he saw Mrs Lamborune get hit. In video footage shown on Deal Or No Deal Mr Uhart explained how: 'I saw her on the ground and she was looking for help and I don't know why but I stopped. Mr Uhart then helped a police officer carry Mrs Lambourne, who was visiting from Canada, about 70 yards to a zone where ambulances were gathered, reports CNBC. He said he tried to keep her calm, so she wouldn't go into shock, and the pair talked about her cats. As Mr Uhart explains his selfless act on the TV show, Mrs Lambourne appears on the set using a walking stick. Within seconds he sees her and rushes over to give her a hug as they both start to become emotional.